Mostly people avoid using Linux as it is more inclined towards commands and not GUI. But some of the distributions like Ubuntu, Mint etc provide good GUI interface to interact and customize things. Using commands will give you a thorough knowledge of the actual things happening inside the system. Like today I connected my laptop to a much bigger display using VGA cable. But my linux distribution based on Debian was not able to recognize this other monitor. Changing the resolution using the normal settings resulted in only two resolution options which were too low. So today we will see how to change resolution of unknown display in Linux. Here is the normal way to change the display resolution using the settings panel. Jump into Menu -> Settings. After that choose Display out of all the other things. If you have connected your laptop/PC to another monitor/projector/display then you will see both. Select the display whose resolution you want to change. If the display is recognized by the system then you will see various resolution options. But that is not the case for unknown display. How to change resolution of unknown display in Linux? We will do this using a preinstalled utility called ‘xRandR’, which can configure the orientation, size and reflection for different output screens. It is really no rocket science, just follow the commands mentioned below and the issue will be resolved. You will get an output like the one mentioned below. Just remember the connected devices parameter from this. Now you have the available resolutions, connected devices, refresh rates and stuff like that. You can always go ahead and add custom resolutions to xrandr if they are not present in the default file. Next we need to generate the modeline for the desired resolution of our unknown display. Mine is a Samsung Syncmaster monitor with a max resolution of 1440×900. After defining the mode, you need to add it in the system using addmode command. This is the final command which will change the resolution of your unknown display. These commands will just make temporary changes until the system is rebooted. After that the changes will be gone, so we need to add this to the startup default parameters. After adding the commands, just give your system a restart and check if everything is working properly. 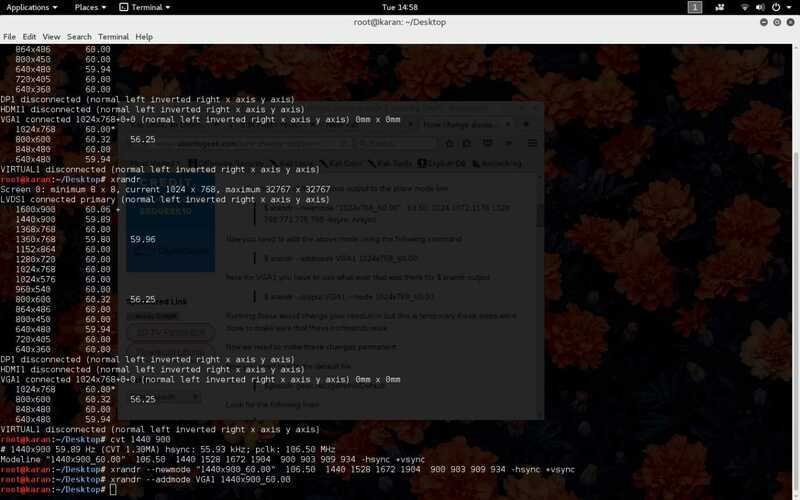 So this is how to change the resolution of unknown display in linux. If you have any doubts please post them in the comment section below. That script threw some errors in my Ubuntu 16.04 because it is creating the modeline too late at boot, so I’ve found that creating a new xorg.conf for unknown monitor works fine because it takes effect earlier on in the bootup sequence.